Marc Batko has been translating some essays by the leading German theologian, Wolf Krötke. Here’s a short piece that he has just sent me: “When God Is Silent” (also available in German on Krötke’s website). “Our God comes, he does not keep silence” (Psalm 50,3). That is a core sentence of the Bible. God can only be God for us because God is not silent. A speechless God is not God in the sense of the Bible. Contemporary atheists confirm this in their own way. Since they no longer hear God, God does not exist any more for them. But God’s silence is not entirely harmless. Whoever does not hear God is not simply free of God. Even atheists become irritated when they are called “godless.” “Godless” sounds so contemptuous. If I call someone who does not believe in God a “godless soul,” that sounds like a condemnation in his ears. “You dubious person,” he hears, “your life lacks any good reason.” No one likes to hear this. That “godless” has this sound for real blasphemers is strange. Our language presumably transports something owed to a biblical experience. The God who by nature is not silent is silent! When this happens, people are spit out, left without any goodness, hopelessly alone and miserable. “O God, do not keep silence; do not hold thy peace or be still,” implores another biblical praying person (Psalm 83,2). When God is silent, the power supply of his spirit and life is missing from our life. Other voices and other powers then fill the empty spaces of God’s silence. All people do not regard this as terrible. The godless type is repeatedly encountered in the psalms as a careless person who likes God’s silence. “Nothing is lacking to me,” exclaims the confessionless person of today who shuts the door on visitors from the community. Since he never hears God speak, he does not notice when God is silent. Isn’t he better off than those tormented by God’s silence since they have good experiences of God speaking? We must take this question seriously in a time when God means nothing for so many people. Whoever would open ears and hearts for God’s speaking tells them the reason for deaf ears and closed hearts. God is silent. All who believe have this experience. In faith in Jesus, it is engraved with the cry of the dying Jesus. “My God, my God, why hast thou forsaken me?” – this is the desperate complaint of the person through whom God’s love spoke like no other. With the words of Psalm 22, he joined with all the complaints of people about God’s silence. He anticipated something that could not be ignored. To many after him, that was the ultimate question in their life. God is silent – that is the experience of persons open for God in the discipleship of Jesus. We may not misunderstand this as insensitiveness for God to which people become accustomed in voluntarily chosen distance from God. In such distance from God, people can be concrete walls for God. The Christian community with its testimony of God’s speaking can and should shake these walls. But if God is really silent though people long for his presence, that is shattering. This can put in question faith and trust in God. Doubt and despair begin to settle in our soul. God’s silence hurts. It sets in like a mysterious wall before us and in us when God’s speaking is necessary. Hope and vigor are taken from persons handed over to the hatred and rage of others. Victims of the elements refuse answers. Gratitude that they are alive is driven out of persons tormented by sickness. Here there isn’t atheist or Christian, religious or not religious. Everyone knows the experience “when we are in extreme distress” and God is silent. Can persons still speak of God in such situations? When God is silent, God is uncommunicative or closed for us. This can only result in our growing silent. Whoever is struck with suffering or tries to help other sufferers experiences this directly. The word “God” becomes like lead in our mouths. We have the feeling of assaulting God and humankind when we begin explaining his silence. “Be quiet at last,” we’d like to shout to someone who promotes himself when God is silent. There are times when we can only be silent with God. Communities that rediscover the old practice of Easter night have this experience. On this night, something else comes into play than the mysterious abyss of God’s silence. In the experience of the Easter light, we notice something like God’s own deep affliction from the pain of Jesus Christ and from the suffering of his creatures. 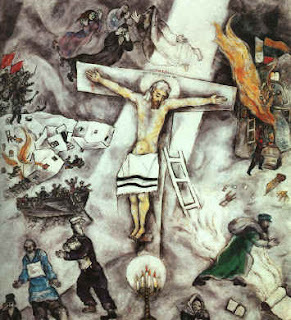 Far away from Golgotha, it is nearly impossible to understand God’s silence as enduring pains that make us speechless. The chasm between God and us is too great. Then the Bible speaks of God’s anger and God’s punishment for our misdeeds. We cannot cross out all this. When God is silent, we always discover what cannot be pleasing to him in our life. Good Friday teaches us that God is with us even in his silence. As he touches us with his silence, he bears the heavy experiences we make when he is silent. In all their gravity, such experiences can stop being ultimate experiences that imprison people in distance from God. They do not prevent us from hearing the words of God’s love in his silence.